Items will be sent by Australia Post or by Couriers Please in some areas, and postage or freight will be calculated at checkout. There is free postage on orders over $200. is urgent, it is best to ring and check, as some items are not always in stock. We accept Visa, MasterCard, Cheques, Money Orders or Bank Transfers. You can ring to order or pay by credit card if you do not want to use our secure online checkout. GST is included (where applicable) in the displayed price in our shop.. 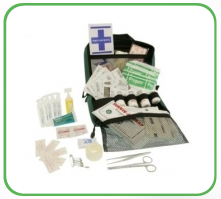 If you are looking for first aid supplies to refill your kit just click on the replenish icon below. Workplace health and safety states that all workplaces MUST HAVE a First Aid Kit. The contents of First Aid Kits should be appropriate for the types of injuries and illnesses likely to occur at the workplace. It is recommended that all first aid kits are in a clean, waterproof container to keep the contents safe and aseptic. A First Aid Kit should also be checked regularly and restocked if any items are used, damaged or out of date. Where burns have been identified as potential injuries, a supply of cool running water and non stick burn dressings should be available. A workplace means premises where people work. These premises include any land, building, vehicle, vessel or aircraft, and include tents and movable structures. 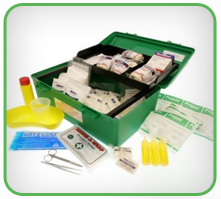 The type of First Aid Kit required is outlined in various OH&S regulations. Eyewash stations should be provided where eye injuries have been identified as potential injuries. At G & A First Aid Supplies we can help you deal with the important but time-consuming job of keeping your business Workplace Health and Safety compliant. We can do this efficiently, reliably and at a very competitive price, leaving you to take care of your business.